We no longer recommend this casino. Are you the type that likes to play not just the classics but new games that ooze with fun and entertainment? Do you like that Braveheart and want to play a slot game based on that? Want your bonus of $250? Are you the one who wants to know who made it possible for online casinos in the first place? Then you’re going to like InterCasino. 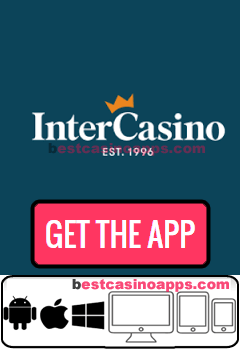 Established back in 1996, InterCasino is the first online casino in the world. Since their establishment, they’ve grown and matured into a worldwide online enterprise with a solid foundation in making sure to satisfy their customers with maintaining their best classic games and adding new and exciting additions to keep things fresh. InterCasino believes in its value of fairness and integrity and that’s why in the event you’re disconnected from your game or you’re slammed with bugs and glitches, InterCasino makes sure to keep your progress where it halts and get you back in the game like nothing ever happened. They are also transparent about their transactions with their players as they reported, since 1996, having done secure transactions of over $11 billion from over 240 countries. When it comes to games, they don’t disappoint. InterCasino offers over 300+ games which include the well-known classics such as blackjack, poker and slots while keeping it fresh with new games such as Juju Jack and Horns & Halos. With that many games in their library, you’ll never run out of games to play with. And with exclusivity to new games from the most popular companies, you’re assured high-quality games with superb entertainment value. They also ensure anyone is a winner with monthly reports on who won a jackpot in what game and what the current payout is for anyone. Like other casinos, InterCasino offers various bonuses one of which is the assured free match bonus. Anyone who signs up for InterCasino is eligible to get a bonus of $200. This is no joke; the $200 is yours to keep and this can be used for up to 600. Now that’s a good incentive to get started with playing real money. InterCasino offers download and instant play options to access their casino. If you’re the patient player, go for the download. If you’re the time-rushed player, go for the instant play. But it all boils down to the easy access and navigation to get started in playing the casino games. One of the best features in InterCasino is you can play without logging in. If you’re not too sure on signing up with the casino, you can play the casino games without making a commitment yet. This is perfect if you’re testing the waters or you want to practice your games before going for the real thing. As always, payment methods are stable and secure. They offer you the best payment methods to ensure your payment is fast and swift. And remember: they’ve made $11 billion worth of transactions since 1996. With that much amount being transferred, it already shows assurance for a solid payment structure. With popular payment sites such as Skrill and NETeller, you won’t have to worry about your payment. InterCasino also offers instructions for each payment method supported. Don’t forget the bonuses they offer. Besides the $600, you have a chance to join their VIP Club. This is for the player who wants more than just customer service. Anyone who joins their VIP Club get lots of freebies that not many casinos can offer you like free passes to international events around the world and special bonuses on some slot games, such as free spins and turns for various casino games. They also offer personally-tailored bonuses known as “My Bonus-4-Life” promos that give you bonus cash for you to use in other games. These are just some of the bonuses you get as a free member of InterCasino. Add this up with your VIP membership and you got yourself passive bonuses to keep yourself in the game. If you’re the type that likes being kept up to date about new games and casino bonuses, InterCasino offers just that. With the Weekly Calendar feature, you’ll know exactly what’s going on and what’s coming up. From new games to new promos, you’re always up-to-date on what InterCasino is doing. InterCasino may be the first online casino in the world but it doesn’t rest on its laurels. In fact, it’s evolving more than ever to become one of the most well-known online casinos in the industry. With their transparent and honest structure, their commitment to showcasing classic and new games and their goal to keep their customers happy, InterCasino has become an evolving market leader in the industry of online casinos.